Who can refute the truth of Truth…? Can anyone ignore the inevitable certainty… …of the spoken word of Sathya Sai…? Avatars…Divine Incarnations…do not say, declare or enact anything for no reason…every syllable is profound, every action has a reason behind it…a meaning quite unfathomable and incomprehensible to a finite mind…bound and limited by many a prejudice. Suffice for us to accept, adjust, appreciate…and wait…patiently…in the august company of trust, certitude and confidence. Patience is the name of the game. Forbearance lends strength. The Lord taught it when He appeared at Shirdi – Divine Utterances that promoted ‘Shraddha and Saburi’. Along with Faith and Patience…Shraddha and Saburi…personal discipline or sadhana enhances the outlook…reinforces positive qualities…majority of the populace forsook while existing in the fast lane of material living. Are we to remain nonchalant about the chaos, conflict, heinous crimes, murder and mayhem that rampantly violates the very being of Mother Earth and Her children…threatening each and every species…? Are we to accept this hiatus as a conclusion…a ‘The End…without much ado’…only to remain sanguine and complacent about the as yet non-fulfillment of His prophecies – exclusively divine edicts and decrees…that hitherto await a birth? He is Who He is…and His Word is what it is – the immutable Truth. After having been in the Presence of and witnessed our Beloved Master’s inimitably transcendental and exceedingly limitless reach…is this the confidence we repose on our Omnipotent Master…on His word…and indomitable Will…on Truth and its existence…its inevitable, irrefutable, undeniable and fundamental victory…? This in-between period in the transit lounge…as we await Truth to reveal Itself…seems long, arduous and unending…however, when we work on ourselves contemplate, concentrate, introspect…complement and elevate…become and be…graduation is a must…we must posthaste absorbingly prepare the self for times of Truth yet to make an astounding appearance. 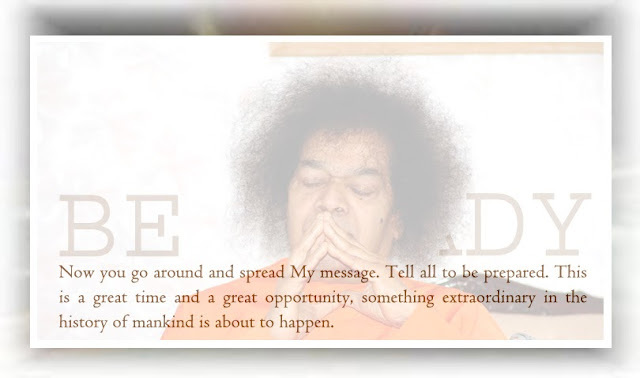 Let us intently peruse the words Beloved Bhagawan spoken to Jairo Borjas when He granted him a divine dream…which amounts to nothing short of a proclamation – Now you go around and spread My message. Tell all to be prepared. This is a great time and a great opportunity, something extraordinary in the history of mankind is about to happen. To dream of God is not a figment of the subconscious mind…for Bhagawan says – When I appear in a dream it is to communicate something to the individual. It is not a mere dream as is generally known. Do not think of these incidents you experience in your dream as stretches of your imagination. Bhagawan elaborates further – Swami appears in dreams only when He wills it…and not when you want them. I come to you and convey what I want to in the most direct manner. Innumerable such dreams and visions are being experienced by so many of our dear sisters and brothers across the globe simultaneously. Don’t these occurrences deserve keen regard and venerated deliberation…? The masquerade of Maya brings in its wake a flood of ignorance that engrosses us all in the play of senses…are we then going to allow our attention to be attracted, distracted and drawn by the mundane chores of life to such an extent that we let precious moments slip by without beseeching the Physical Presence of Bhagawan Sri Sathya Sai. The Formless can at will assume any Form…yet the CEO of Faith, has to re-assume this particular Form…not simply because It is adored by countless beings cosmically…but to reflect and effect the truth of His Word. His might is such…that nothing is impossible for That all-powerful and absolutely invincible Supreme Personality Who willed forth creation…and Who chose the enchanting form of Sathya Sai for His present advent. It is your yearning that decides in what form the Lord appears. You call and He answers. If you are not earnest, if you feel indifferent…and say - Let Him come when He wills, in the Form He likes and with the Name He prefers - He will not come at all. Call on Him with anguish; He will respond. Even as the mind does wander and wonder…at times through stormy tempest and the dense fog of suspense…eventually, with the onset of crisp and clear clime brought on by the luminescence of inner conviction…we must acknowledge, be aware, deeply believe and know…that the era of Sathya Sai has much more in store. The advent that took place on Monday, 23rd November 1926 at 5.06 am…was not just an extraordinary arrival of the Divine in the physical…but the superlatively Supreme Advent of all Advents…out-surpassing all previous Incarnations and any future ones to come…sovereign…towering unparalleled and matchlessly ultimate. Do we have even an iota of inkling how very privileged we are…the glorious golden times we are about to and have been chosen to witness…which generations to come will applaud and speak of in hushed awe and absolute wonderment…? Nothing with the Divine is a slip-up…every word is an assurance, an assertion, a hint, a clue, an intimation…a weighty affirmation…nothing and no one can hinder the bud of truth from blossoming into an exotic bloom. Nothing! Only He knows the outcome of His play…for our part…with utmost faith we must await that magnificent conclusion. Speculation, conjecture, debates will not provide any succor or benefit. It is only our intense and consistent inner conviction that will ring in a royal celebration…it is only our firm belief that will herald in global and universal relief. Let us chant ‘Samastha Lokaah Sukhino Bhavantu…Samastha Jeeva Sukhino Bhavantu’…even as we await that right royal ‘grand finale’…of this His most charismatic play. His entrance was ever so spectacular…His exit, when the time comes for it, once this period of intended intermission bids adieu…will…as it is wont to…display the perfect and illustrious fanfare…befitting the Emperor of all Avataars. Let us pause not…to gather that critical mass…let neither a moment…nor a breath go waste…while seeking the embrace of His grace…for that act of Divine Will…which will benefit mankind and all of creation boundlessly. What song does your soul sing…? Sairam! The expressions of feelings here are whole Truth about our existence on earth. Let us not waste our precious energy any more in useless and frival talks. Om Sri Sai Ram. Today I had gone through this article once more. What a profound vibrations it creates on the mind. Whenever we feel depressed or sad, we need to go through such articles of inspirations. Thanks to SKTC for sharing such soul filling articles! Aum sri sai ram ! such a morale uplifting article ! waiting has become a penance. hope holding on to faith..each day starts with yearning..that too when it rains ( as it is now in chennai )thinking ' is it going to happen now ? ' life is nothing but looking out for signs...of HIS reappearance. tears swelling now and then...thinking of that beautiful angelic form...so optimistic that even visualizing newspapers headlines screaming " RETURN OF THE ETERNAL " .."SUPRA ENERGY STRIKES AGAIN"
when will it be my LOVE ? answer our prayers , quench our thirst, satiate our hunger soon. we have none except you !Aana hi padega baba aana hi padega !!!! Sairam! He waits to perform ten tasks at one stroke, hence the delay! Swami ..we know at any moment u may come ,but we urge you plead you beg you to come come at this time ..let swamis era starts ..sanathana saradhi ..THY KINGDOM COME !!! !